In easy view of crisscrossing highways and towering industrial parks, dozens of people marched through East Oakland’s flatlands wearing white surgical masks on Saturday. Families pushing strollers, men in suits, and kids with skateboards walked from Tassafaronga Recreation Center to Acorn Woodland Elementary School to celebrate ‘Love Yo Mama’ Earth Day and to call attention to environmental degradation in inner city neighborhoods. As one boy suctioned the surgical mask to his face, he quickly lifted it back off saying, “Ew, my breath stank.” But, regardless of his breath, he put the mask back on and marched in solidarity with the crowd. 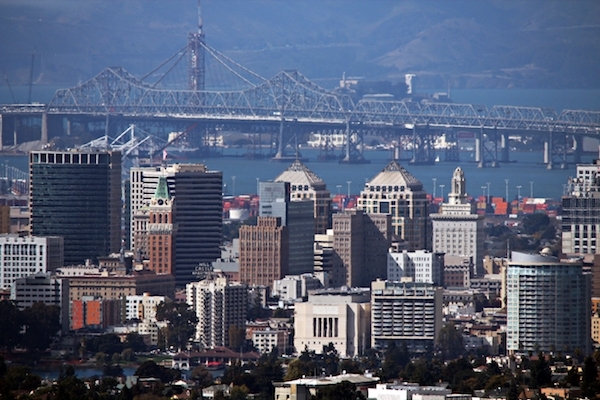 Last fall, Communities for a Better Environment-one of the march organizers — released a study showing that the Bay Area Air Quality Management District and the California Air Resource Board have major regional gaps in their emissions inventory. This means that, according to CBE, large parts of East Oakland are not being regulated, controlled or monitored for hazardous pollution, even in neighborhoods where people live. “Children in the East Oakland area are hospitalized for asthma one and a half times more than children in the rest of Alameda County,” said Ana Orozco, a community organizer with CBE. On nearby San Leandro Street diesel trucks sit and idle while waiting for their goods from the port, “adding to the pollution,” Orozco said. CBE says this is a national trend and often toxic and polluting sites are concentrated in low-income communities of color. Marchers placed informational pamphlets in Spanish and English on several tables lining the entrance to Acorn Elementary School, the radio station 93.3 La Raza blared Banda in the background, and volunteers stood on call to talk about the need for East Oakland residents to be aware of the environment and their right to live in a healthy community. On the opposite side of the school, on the outdoor basketball courts, a hip-hop DJ played old school jams while kids rushed from the march to sign up for a skateboard contest. The volunteer DJ, Ryan Espinoza, was happy to spend his day helping out this cause. “I schedule my work around these events,” he said. For more information on the environmental justice movement in Oakland, visit Communities for a Better Environment, HOPE Collaborative and Green for All.